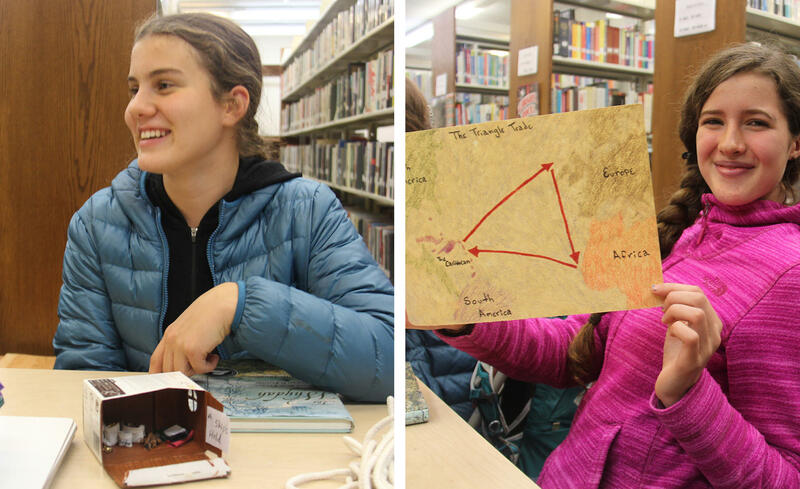 Luna Burkland, left, and Greta Bernier consult the book during their group's discussion at Springfield Town Library about "The Whydah: A Pirate Ship Feared, Wrecked and Found" by Martin W. Sandler. For example, 13-year-old Greta Bernier led a discussion on the triangular trade route of the early 1700s. Ships full of gold and goods acquired from selling slaves were prime targets for plundering pirates. And in 1716 there were few ships stronger or faster than the Whydah which, on its maiden voyage, was carrying a hold full of riches back to England when a pirate captain named "Black Sam" Bellamy climbed aboard and made it his own. And for more than a year Bellamy used the Whydah to terrorize merchant ships and steal their haul. Until, weighted down with treasure, it ran into a sandbar off the shores of Cape Cod. There it sunk — and remained undiscovered for hundreds of years. In 1984, it became the first sunken pirate ship ever to be found. And now, 34 years later, marine archeologists are still combing through the site. According to The Whydah author Martin W. Sandler, there's at least one thing left to be discovered. Martin W. Sandler: "They’ve found so much wonderful stuff, but they haven’t found the mother lode yet. We know, because it was all so well-documented that, among other things, between those decks in pouches already assigned, there was over $4 million in money – that day’s money – in coins. Which would probably be a couple of billion dollars today." That money was assigned to the pirates working for Captain Sam Bellamy, nearly all of whom died in the wreck. Lukas Foley listens in during the meeting of Dorothy's List readers at the Springfield Public Library to discuss author Martin W. Sandler's nonfiction book "The Whydah: A Pirate Ship Feared, Wrecked and Found." Sandler says, while there’s still a lot to discover from the wreck of the Whydah, it has already taught us so much. Martin W. Sandler: "What they’ve found in the artifacts has changed almost everything we ever knew about pirates." Martin W. Sandler: "The pirates did not say, ‘Avast ye, matey.’ They did not say ‘Argh.’ They spoke like the middle-class merchant seamen most of them were before they became pirates. They did not wear eye patches, and no one has ever found the bones of a parrot yet, on a sunken pirate ship." Martin W. Sandler: "First of all, they dressed magnificently. And the reason they dressed magnificently is because they were grabbing all these wonderful clothes out of the loot that they were taking from ship after ship after ship." At left, Julian Roberson holds up a pirate flag, presenting it to fellow Dorothy's List readers. At right, Ella Shaw showcases a poster that describes what the fashion of the Whydah's time period looked like. 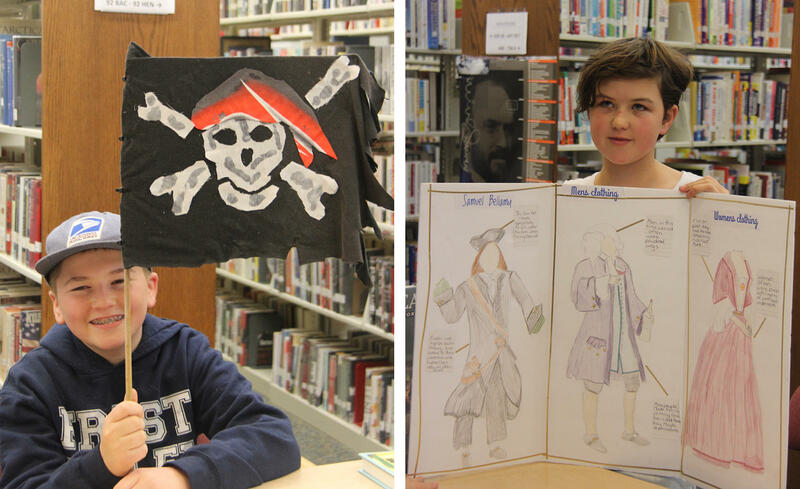 At the Springfield Town Library, 11-year-old Ella Shaw shared a project she created, depicting fashions during the time of the Whydah. Ella had a question for the author not about clothing, but about food. Ella Shaw: "I was wondering what kinds of things did pirates eat?" Martin W. Sandler: "They fished a lot. You know, they’re out to sea a lot and so they had fresh fish a lot. And also, they were able to put into port a lot. So they were able to get provisions from places … where you’d get provisions on shore. "Also, they’re continually — particularly this ship, particularly the Whydah — they’re continually capturing other ships. And when they’re capturing other ships, and you know along with the loot they’re after like gold and diamonds and that kind of stuff, they’re also – they’re taking food stuffs. And they’re taking good stuff to eat that the crew of the other ship did." 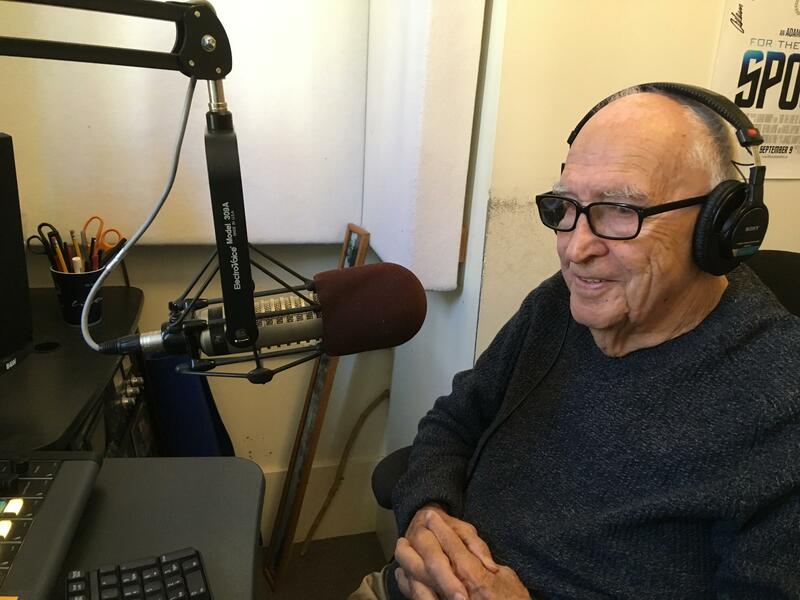 Author Martin W. Sandler sits at a microphone at WCAI, on Cape Cod, on the day he answered questions that children posed at the Springfield Town Library about his book "The Whydah: A Pirate Ship Feared, Wrecked and Found." Before the Whydah was a pirate ship, it was a slave ship. But while many Africans were captured and sold into slavery during that time, Sandler’s book tells us that all pirates were treated equally on Sam Bellamy’s ships. Thirteen-year-old Greta Bernier wanted to know if that was common practice among pirates. Greta Bernier: "I was wondering if Africans were treated fairly on ... other pirate ships during that era, or if it was just something, like, significant of the Whydah." Martin W. Sandler: "Boy, you guys got good questions. I really don’t know. I don’t know for sure. I do know that every person who became a pirate had to sign that letter of agreement which really governed their behavior. So I wouldn’t be surprised … if that was all pretty much the same. "I mean, one of the things that I’ve found that really startled me the most … is the fact that the pirates had the greatest democracy in the world. And they really did. And part of that democracy was that they treated – if a person was brown, black, yellow or green ... they really did treat them all the same. It seems to be universal. Now a lot of it, a lot of it, had to do with the captains. And some of the captains were much more humane than others. So I would never say unequivocally that they were all treated the same. But certainly on the Whydah they were treated the same." The Articles of Agreement that Sandler just referenced were a code of laws that all pirates had to sign onto before becoming an official crew member. The Articles spelled out their right to vote, their share of the loot and how they would be compensated if injured. The Articles also dictated how they were expected to behave, how to settle quarrels, and punishments for crimes against fellow pirates. At left, Luna Burkland sits behind a diorama project of a ship's hold. At right, Greta Bernier holds up a map project of the triangular trade route. Fourteen-year-old Luna Burkland wanted to know why Sandler chose to write a book about a pirate ship. Luna Burkland: "What inspired you to write the book?" "There are over three million shipwrecks lying down there, and when a ship goes down, particularly the ships from two- and three-thousand years ago, it becomes an instant time capsule. And you can learn more from what you can find in those ships about how people lived, how people worked, the trade routes that they traveled and so forth, than anything you can find on land." Julian Roberson: "Does writing energize or exhaust you?" Martin W. Sandler: "I don’t get exhausted – I love it. I have the best commute that any person ever has. I have my offices on the top floor of my house. And I will tell you, I … do a lot of stuff. I play tennis. I was … the senior tennis champion of Cape Cod. I love to go to movies. I love to read books. But what I like most of all is to write, and particularly I love to research. "I love to find stories that nobody’s ever heard about — I don’t want ‘em to be trivial, I want ‘em to be important. ... And then it becomes like a big detective hunt. So that, it energizes me. And, in fact, I’m just about to start a new book on the beginnings of flight, and I can’t wait to get home and get out of here and go get started on it." Matthew Abare holds up a poem project about the Whydah, which was written onto paper that is made to look like an aged scroll. 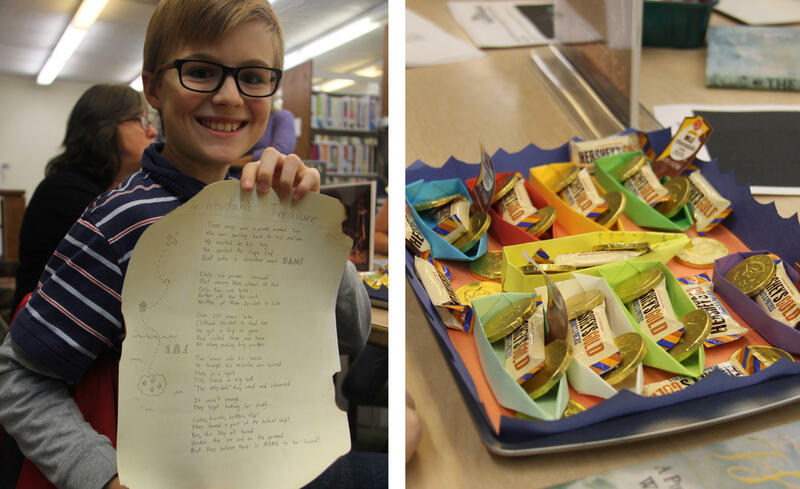 At right is another part of Matthew's project - paper boats that hold "treasure" (aka gold-wrapped chocolate coins). Matthew Abare: "I was curious, do you hide any secrets in your books that only a few people will find?" Martin W. Sandler: "That’s a great idea! ... No I have not. And maybe now I’ll start. I have never thought of doing that. Oh my goodness. No, I have never, I have never done that. I wish I had, but I haven’t." Lukas Foley: “I was wondering why you wrote this book." The author said he writes for a lot of little reasons, and one big reason. Martin W. Sandler: "I sit down in the morning and I sit down with a blank … pad of paper. And I write maybe seven, eight pages if I’m lucky. And by the time I’m done, what’s on those seven or eight pages is going to be read by maybe 30,000, 40,000 people before the life of that book is over. That’s a big deal to me. "Now you have to understand, I have an enormous ego. So it’s very important to me that I can do that. But also, I think it’s a service. … You know, I like to think that I’m not just only making money writing books. I’m not only getting a little famous writing books. I’m also making a real contribution. And that’s very, very important to me. "And I hope that whatever you guys do … you’ll do something [that] not only is rewarding to you financially and rewarding to you in many ways, but also that you feel that you’re really contributing something to the world. Because, to me anyway, that’s terribly important." Thanks to Sandler's book, and to the team that discovered the Whydah and is recovering her secrets, we know a lot more about the early 1700s and how pirates really lived. Special thanks to Springfield Town Library Youth Services Librarian Michelle Stinson and to WCAI in Woods Hole, Massachusetts. Insignificant Events in the Life of a Cactus by Dusti Bowling is the next selection on Dorothy’s List. Ask your librarian for a copy so you can read along. Find more episodes of Dorothy's List here.